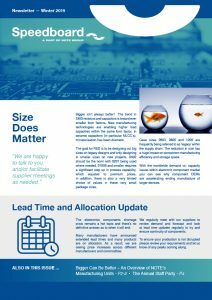 In this Winter 2018/19 edition of our newsletter, the cover story talks about how size does matter, and in respect of ceramic capacitors, then smaller can be better. Lead times and the impact on the industry remain a significant challenge. There is more on this on the front page. Speedboard became part of the NOTE Group in November 2018. We are currently transitioning to new branding as you will see in this newsletter. This is an exciting stage in Speedboard’s life and a great opportunity to build on what we have already achieved and strengthen our market position – which is good for our customers, suppliers and employees. You can read more about NOTE and the manufacturing units in the newsletter. We share some photos from our staff party where Speedboard celebrated 35 years in business. We also said goodbye to four team members last year, as they took retirement. Collectively they accumulated over 50 years’ service at Speedboard, a fantastic achievement. Click link to download a PDF version of the Winter 2019 Newsletter.